Embodiment is the way people experience their bodies through their senses, and we are never in a truer place of embodiment than the moment we’re born. As infants, we are acutely aware of the happenings in our lives as experienced within our bodies (even though we are not able to verbally express those needs). When we were hungry, we cried out for food. When we were full, we stopped eating. When we didn’t like something, we turned our heads away or pushed it away with our hands. At this stage in life, we were guided by our senses, instincts, and experiences within ourselves alone rather than experiencing the world through the lens of thoughts or others in mind. As we age, we become more and more aware of those around us, and instead of using our senses and connecting through the direct experience of our bodies, we start using our minds to guide us through the world. Sometimes our minds consider how we believe others may be perceiving us to the point where we start experiencing our own bodies through the lens of an outsider. Being disconnected from your body can lead to disordered eating. This happens when our minds trick us into thinking we’re larger than we really are when we look in the mirror or that we’ve eaten more than we’ve really eaten. This can make us feel out of control. When we believe these thoughts, we might engage in harmful practices such as eating disorder behaviors, and even using drugs to place a level of control, albeit illusionary control, back in our lives. 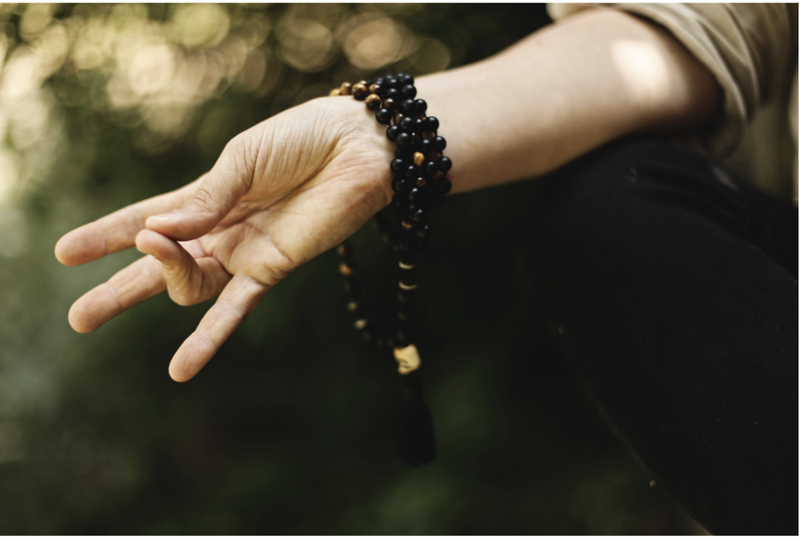 The wonderful thing about practicing mindfulness is that it allows us to bring our attention with intention to our senses and experiences within our bodies in the present moment. Try this mindfulness exercise for embodiment to help you navigate your way through all your senses. Take a seat and close your eyes. Feel how the bed, couch or chair feels beneath you or how the floor feels under your feet. What do you notice? Points of contact? Pressure? Now notice your breath. As you inhale, try to follow your breath as it flows from your nose to your lungs. When you exhale, follow it as it travels up and out of your nose. There is no need to breathe in a contrived way. Can you settle your awareness on where you feel your breath most easily in your body? Now open your eyes and bring your awareness to your sense of sight. What do your eyes see? What colors, textures, and objects do you see? Now close your eyes again and what do you hear? Are there sounds outside the room? Inside the room? Can you hear your own breathing or any other sounds you are making? Do the same for your sense of touch, smell and taste. Then, check in with how your body is feeling. Does it feel energized or tired? Hungry? Full? Does your body feel healthy? Are your legs tired from a long day? Allow your body to give you the cues and trust its wisdom to know what’s right for you and it in this moment without judgment. The more you understand and respond to these cues of hunger/fullness, energy levels, and feeling healthy/unwell, the better you understand yourself and your needs. You know how sometimes people say “I just listened to my gut” when making decisions? According to psychiatrist and author Dr. Dan Siegel, the insula plays a key role in this. The insula is a small region of the brain located deep inside the cerebral cortex (and until fairly recently, hadn’t been discovered). It’s responsible for your self-awareness of your somatic experience or introceptive-awareness (which helps you understand and feel what’s going on inside your body) and how your body and emotions interact to create a perception of the present moment—which you can only do when you are embodied. This awareness of emotion and bodily feelings is the foundation of one’s sense of self, which is usually fragmented or feels lost with an eating disorder. The insula has been found to be smaller in individuals with anorexia, as well as after traumatic events, which often underlie eating disorders, but according to Dr. Dan Siegel, practices like yoga and meditation have been shown to increase the size of the insula and improve introception. This is because mindfulness and yoga promote embodiment and the integration of the mind and body. The key to embodiment practice is to reconnect with and sense the body as if from the inside out, instead of from the outside in. The body is one of your greatest sources of wisdom, and it tells you what you need to know. Every time you listen to your body’s signals and respond appropriately you build trust with your body strengthening confidence in yourself. Reserve 20 - 30 minutes of your mornings for yoga or meditation practice. The more you practice, the more self-aware you’ll become and the more you’ll be able to rely on your body and its instincts to guide your decisions revolving around food, exercise, self-care and other areas of your life. To start your journey, sign up for my free guided meditation series that will help you develop a strong foundation of self-love and healing. It’s important to realize that the mind and body are not separate entities, but one. They may have become disconnected, but it’s possible to reconnect the mind and body so they can guide you in your recovery. Be sure to subscribe to my newsletter to find out more about how you can embrace your body, yourself and your life with more love and kindness or follow @kindfulbodyon Instagram. Marcella is a licensed Marriage and Family Therapist, Certified Eating Disorder Specialist, certified Mindful Self-Compassion teacher, Certified Daring Way Facilitator and certified yoga instructor. Marcella is dedicated to helping others recover from eating disorders and body image issues as well as trauma, anxiety and depression. In her private practice in the San Francisco Bay Area she specializes in utilizing mindfulness and compassion-based psychotherapy, as well as Internal Family Systems. To support clients in their healing, her focus is the integration of body, heart and mind, so clients can awaken to their inner strengths and wisdom to make healthier choices in their lives as well as cultivate healthier relationships with themselves and other people. In addition to Mindful Self-Compassion, Marcella teaches Mindful Eating and the work of Brené Brown. She is also the founder of Kindful Body, an online resource to help cultivate self-compassion, self-acceptance, self-care, and self-love for ourselves and our bodies.